Aldara cream is used to remove superficial basal cell carcinomas (sBCC’s) and solar keratoses (sunspots). Aldara is available on the PBS, but only for the treatment of biopsy proven sBCC's. Aldara works by stimulating the immune system to produce an inflammatory reaction that destroys precancerous and cancerous cells. Aldara is available as sachets or as a pump. If you are using the Aldara pump, remove the protective cap and prime several times until cream appears at the nozzle. If you are using the Aldara sachets, open a sachet of Aldara and squeeze some cream onto your fingertip. Aldara is used for 5 consecutive days a week (eg Mon-Fri) for 6 weeks. It should be left on for 6-10 hours, so it is best applied at bedtime. Rub the cream on to the area to be treated and include 1cm of surrounding skin. Wash off the medicine in the morning. If the skin reacts too much, stop the treatment for a few days and do not reapply until the area is only mildly to moderately inflamed. 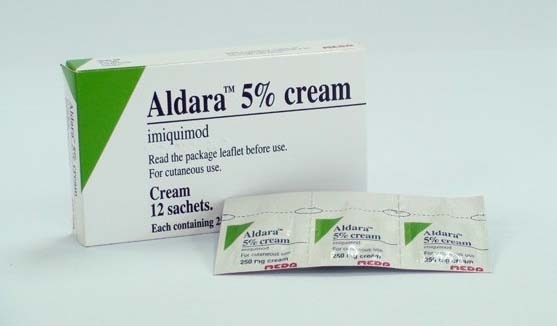 If you miss a dose during treatment with Aldara, it is not necessary to make up the missed dose or to prolong the duration of Aldara therapy. If you need to repeatedly miss doses due to overreactions, slow the applications to 3 days a week (eg Mon, Wed and Fri). Aldara is used for 3 days a week (eg Mon, Wed and Fri) for 4 weeks. It should be left on for 6-10 hours, so it is best applied at bedtime. The maximum treatment area is 25cm2. The course can be repeated after 4 weeks if necessary. Local reactions at the site include redness, wearing away of the skin, flakiness, swelling, hardening under the skin, small open sores, crusting, small bubbles under the skin, itching, burning, pain, tenderness, irritation, rash, soreness, stinging, sensitivity, bleeding, lumps on the skin, infection and pimples. Most of these skin reactions are mild to moderate, and are signs that the product is working. Some patients have experienced changes in skin colour (lighter or darker) in the area where Aldara cream was applied. These changes may be permanent in some cases. General reactions include flu symptoms, tiredness, fever, headache, diarrhoea, back pain, muscle pain, and swollen glands in the neck, armpit and groin. General reactions are more likely when more than one lesion is treated at a time.